Australian Medical Student Journal, Volume 4, Issue 2 2013, pp. 40-42. Open Journal of Pediatrics, 3, 370-376. doi: 10.4236/ojped.2013.34067. Radiation exposure has been linked to increased risk of congenital hypothyroidism (CH) for decades. CH is a relatively uncommon condition, occurring in about 1 of 2000 US births. Thyroid Stimulating Hormone (TSH) levels for each child born in California permitted an analysis of combined confirmed and borderline CH cases. Borderline/confirmed CH cases are more than seven times greater than just confirmed cases. Airborne levels of gross beta nuclear radiation in the US were elevated in the period starting several days after the Fukushima nuclear meltdown, especially in west coast states like California. The borderline/confirmed CH rate for newborns during the last 9.5 months in 2011 (exposed to Fukushima in utero) vs. births during other periods in 2011 and 2012 (not exposed) was significantly elevated, suggesting that adverse health effects to the newborn thyroid were not restricted to just a small number of confirmed CH cases. The sensitivity of the fetus to radiation exposure, plus the presence of thyroid-seeking radioiodine, suggest further analysis of Fukushima’s potential to cause adverse health effects in newborns is needed. See Also: How to Reduce Radiation Risk. Common sense and some basic information can greatly reduce radiation exposure and risk for most people. Here is some basic information to help you minimize your dose and risk. home of the National Radiation Map, depicting environmental radiation levels across the USA, updated in real time every minute. This is the first web site where the average citizen (or anyone in the world) can see what radiation levels are anywhere in the USA at any time. Kevin Kamps, Beyond Nuclear joins Thom Hartmann. More than a year into the nuclear crisis at Fukushima - radiation levels have now reached their highest point yet. What does all this mean - and what should nuclear supporters in America be taking away from the continuing crisis? after high doses of radiation were detected. in other countries if precautions aren't taken. 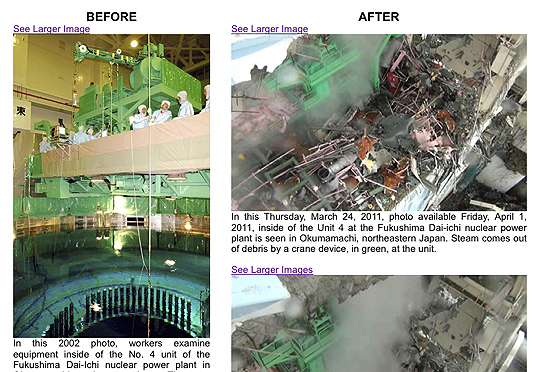 Take responsibility for the major accident at the Fukushima Daiichi Nuclear Power Plant. The government must make change to move away from nuclear power, toward renewable energy sources! We demand all nuclear power plants are decommissioned and the complete withdrawal from production of nuclear energy! Realise the danger of earthquakes and tsunamis demonstrated by the accident at the Fukushima Nuclear Power Plant, shut down all nuclear power plants in operation and begin the decommissioning process. Repeal white paper submissions for all new plant locations and extension plans. Close Rokkasho Reprocessing Plant and Monju; abolish work with plutonium thermal reactors. TEPCO and the Japanese government must clarify and meet their responsibilities. We demand release of information to the public, an expansion of the evacuation area, repeal of the increased levels of legal yearly radiation exposure, and compensation for victims! Release information speedily to the public in regard to the accident at Fukushima, consequent contamination and radiation exposure. Expand the evacuation area. Urgently carry out measures required for the evacuation of people: especially from regions where radiation contamination is high, of pregnant women, infants, children and students. Revoke the increase of the yearly radiation exposure level to 20 millisieverts (mSv). Lower the legal allowances of radiation in food. Sincerely consider internal radiation exposure: protect the original standard of safe total yearly exposure to the whole body at 1 millisievert of radiation. Administer long-term health assistance for local residents exposed to radiation, assessing all possibilities, including external and internal (air, water, food) exposure. Compensate victims of radiation exposure. Revoke the increase of the yearly radiation exposure level for workers to 250 millisieverts. Thoroughly administer the radiation exposure of workers who work in high radiation conditions, their safety and their health. Compensate victims of radiation exposure. Stop releasing radiation in to the ocean. Grant compensation to local residents, workers, farmers, dairy farmers, and fishermen. All compensation for this major accident should be paid primarily by TEPCO and electricity business operators. from Japan Atomic Industrial Forum, Inc. The LLRC carries basic advice for people living downwind of the releases of radioactivity. Do-It-Yourself monitoring to protect your health. Outer building is damaged and it is presumed that there was a partial meltdown. Small amounts of radioactivity have been vented. Reactor has 400 fuel assemblies, the spent fuel pool has 292. Partial meltdown is presumed to have occurred. The primary containment vessel is cracked and some radioactivity has vented. Reactor has 548 fuel assemblies, the spent fuel pool has 587. The reactor used uranium and plutonium, which may produce more toxic radioactivity. The spent fuel pool may have become uncovered. Reactor has 548 fuel assemblies, the spent fuel pool has 514. Spent fuel rods in a water pool may have become exposed to air, emitting radioactive gases. An explosion and fire have damaged the building. No fuel assemblies in reactor; 548 were removed for maintenance and are part of 1,479 in spent fuel pools. 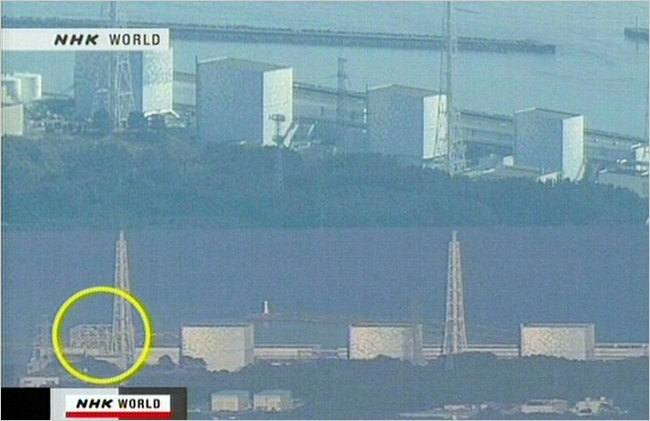 The reactor is shut down and the building is not damaged. But there is concern that spent fuel in the building may become exposed to air. Reactor has 548 fuel assemblies, the spent fuel pool has 826. The reactor is shut down and the building is not damaged. But there is concern that spent fuel in the building may become exposed to air. Reactor has 764 fuel assemblies, and there are 1,136 in spent fuel pools. Published on 03-17-11 from the INSTITUT DE RADIOPROTECTION ET SÛRETÉ NUCLÉAIRE (IRSN), the French Government's official agency on radiation and nuclear matters. English Translation of the following produced by Google Translate. Anyone who can help with more precise French translation please contact Dave Ratcliffe. IRSN simulated atmospheric dispersion of releases estimated between 12 and 20 March, using its numerical model applicable to long distance (scale of several hundred kilometers), using weather forecasts provided by Météo France. This simulation was applied to the cesium 137, as a tracer of the plume during this period. The results of this simulation, conducted every hour from 12 March, are expressed in becquerels of cesium-137 per cubic meter of air (Bq / m 3). For comparison, values measured near the Chernobyl plant, shortly after the accident on April 26, 1986, exceeded 100 000 Bq / m; they were in the range of 100-1000 Bq / m 3 in the country most affected by the plume (Ukraine, Belarus); France, values measured in the east were the order of 1 to 10 Bq/m3 (May 1, 1986). Today, a very low activity of cesium-137 remains in the air, on the order of 0.000001 Bq/m3. The Low Level Radiation Campaign website carries basic advice for people living downwind of the releases of radioactivity. We warn that reassurances from all agencies including IAEA and national offices of nuclear safety are based on the invalid and discredited radiation risk model of the International Commission or Radiological Protection (ICRP), according to which the Chernobyl disaster can not have caused any observable health effects in the general population. Immediate precautions for populations downwind of Fukushima are to stay indoors. Do not eat local produce; drink bottled water. CNIC held a press conference in Japanese with English interpreting at the Foreign Correspondents Club of Japan. Speakers included nuclear experts associated with CNIC who are analyzing the unfolding disaster at the nuclear power plants in Fukushima: Hideyuki Ban, CNIC Secretary General, Masashi Goto, Former Nuclear Power Plant Designer, Chihiro Kamisawa, CNIC Senior Researcher. The Citizens' Nuclear Information Center is an anti-nuclear public interest organization that seeks to provide reliable information and to educate the public on the hazards of nuclear power. Hideyuki Ban is also the antinuclear activist on the committee advising the government concerning its Long-Term Program for the Utilization of Nuclear Energy. The first indication that the Fukushima reactor was in serious trouble came from reports that the Japanese military was flying batteries to the plant. This clue made it clear that the operators were having more problems than just trouble with circulating reactor coolant. 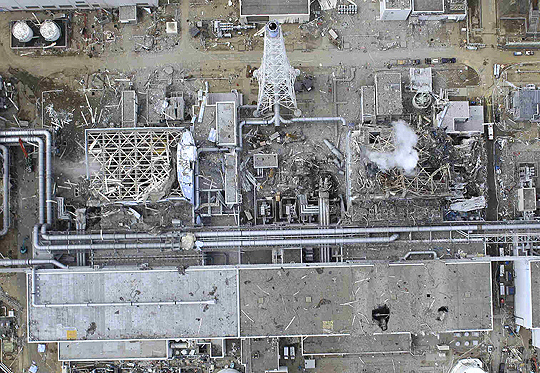 It revealed that the operators were losing or had lost electrical control of the reactor systems and that the emergency diesel generators were not working. But the Japanese government and the industry continued to downplay the dire conditions facing them. This same pattern of denial happened here at Three Mile Island leaving the citizens and their governor bewildered and confused. In fact, radioactive releases at TMI are presently being reported as a miniscule amount of radiation. At least 13 million curies of radiation were released. So it is easy to see how the Japanese crisis brings back various details of the TMI crisis. The Citizens' Nuclear Information Center (CNIC) is deeply concerned for the health and safety of the people affected by the earthquakes and tsunamis that have struck Japan over the last two days. We are particularly concerned for the people in the vicinity of nuclear power plants, including workers who are trying to minimize the scope of the disaster. 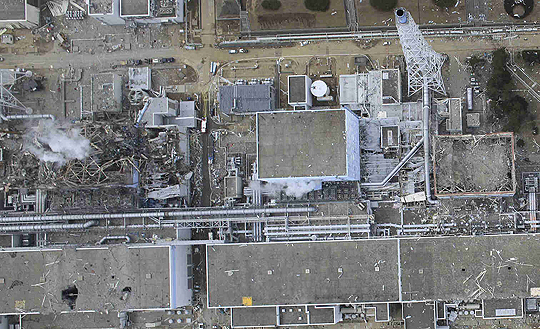 Unit 1 of the Fukushima Daiichi Nuclear Power Plant is in a state of meltdown. 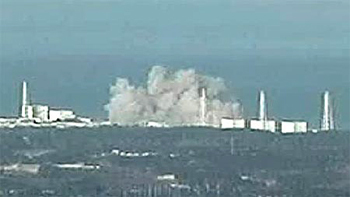 A nuclear disaster which the promoters of nuclear power in Japan said wouldn't happen is in progress. It is occurring as a result of an earthquake that they said would not happen. This could and should have been predicted. It was predicted by scientists and NGOs such as CNIC. We warned that Japan's nuclear power plants could be subjected to much stronger earthquakes and much bigger tsunamis than they were designed to withstand. Besides the question about how this accident will unfold, the big question now is, will the government and the nuclear industry acknowledge its mistakes and change track? Last December the Japanese government began a review of its nuclear energy policy. The review was commenced in the spirit of essentially confirming the existing policy. That approach is no longer viable. The direction of the policy review must be completely reversed. It must be redirected towards developing a policy of phasing out nuclear energy as smoothly and swiftly as possible. See Also: Fukushima Dai-ichi Unit 1 reactor schematic and description at Beyond Nuclear. In 1986, Harold Denton, then the NRC's top safety official, told an industry trade group that the "Mark I containment, especially being smaller with lower design pressure, in spite of the suppression pool, if you look at the WASH 1400 safety study, you'll find something like a 90% probability of that containment failing." Denton has previously "served" as the NRC's point man sent into Three Mile Island Unit 2 reactor control room in the first hours and days of the 1979 meltdown accident. Vermont Yankee, just two-three days ago, got a 20 year license extension from the US Nuclear Regulatory Commission, effectively overriding the deep and broad opposition to the license extension, from the Democratic Governor Peter Shumlin, to the State Senate which voted a year ago by 26 to 4 to shut down the reactor, all the way to grassroots environmental activists across the state. Obviously, the Vermont Yankee containment is questionable now -- it's been questionable for decades. While earthquakes may be considered rare in Vermont, they are not unheard of, or beyond the realm of possibility. But of course there are other pathways for accidents, or attacks, at Vermont Yankee, that could end in similar results as what is unfolding at Fukushima Daiichi nuclear power plant -- from age related degradation at the 40 year old Vermont Yankee atomic reactor causing systems, structures, or components to fail, to an intentional attack on the fragile, flimsy facility.